In the last few posts we’ve taken a look at common crossfit phrases as well as how to proper barbell care and how to load weight correctly! We are now going to take a look at scaling different movements to fit the needs of your body. This is in preparation for “The Murph” coming up Memorial day weekend. 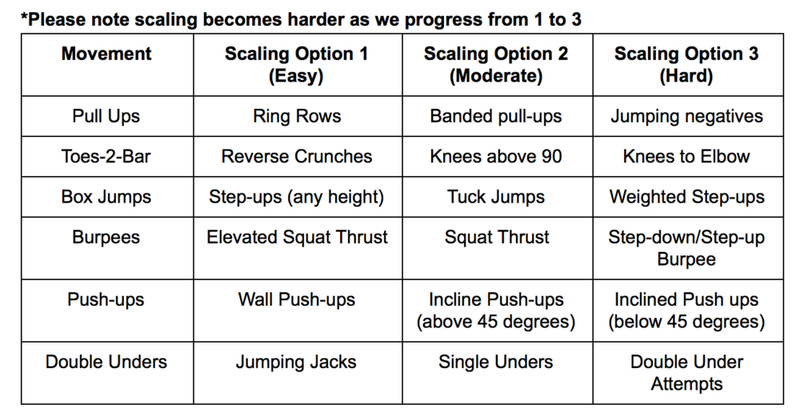 Please dispel the notion that scaling a workout makes you insert whatever negative word here. Scaling means that you are paying attention to what you body needs, more than your ego wants. Your ego can get you hurt, injuries lead to more time out of the gym, which can lead to a decline in progress. You want your workout to be difficult, but do-able. So when in doubt of whether or not a movement is attainable, or not hard enough, ask. If this sounds like a lot to you keep in mind that you can scale everything or you can even find a partner and split the work with! You can scale the reps altogether and do a half or a quarter of them. Additionally MURPH does not need to be done straight through, you could do 20 rounds of 5 pull-ups, 10 pushups and 20 air squats. Consider scaling the run if you don’t think you can do 2 miles. For pull-ups you can sub ring-rows and push-ups can be done on your knees. Below are general scaling ideas for several major movements. Again, when in doubt, ASK. Levels: Not Just for Video Games!